LINDA TRACE DESIGNS: Simon Says Stamp May Card Kit-DUDE! I'm back with another of the cards I made using the Simon Says Stamp Card Kit of the month for May, which is called Play! This is such a fun, boy-themed kit, and its so easy to put together some really cool cards. 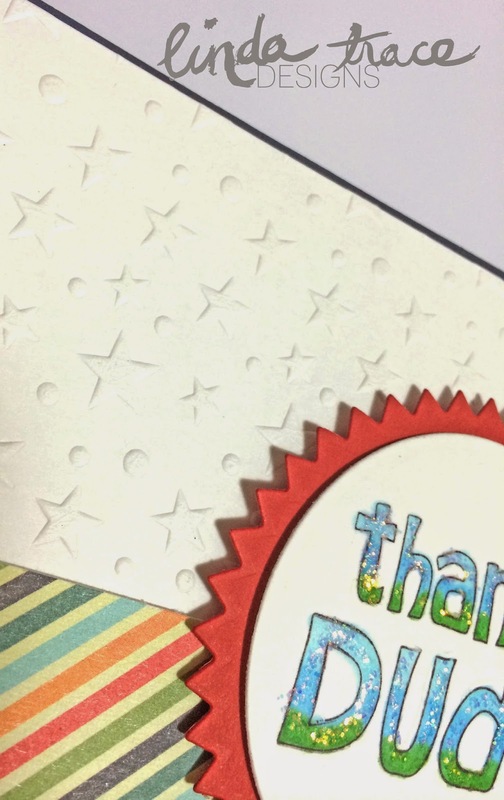 I took the Simon Says Stamp Stencil STARS AND DOTS and instead of using it as a stencil, I used it as an embossing 'folder'. I ran it through my Big Shot, with a piece of the white cardstock that came in the kit, and one of these embossing mats (instead of using two cutting plates like I'd do for diecutting, I used one cutting plate, and one mat, with the cardstock and the stencil in between). This gave a really cool raised effect, you can see above. Next I added some patterned striped paper to the bottom third of the cardstock, and rounded the edges. After stamping 'thanks' and 'dude' in Memento ink, I coloured them with Copics, making the blue fade into the green. When that was dry I added some stickles to the letters. I then diecut the sentiment out using a circle die, and added it onto a pinked-edged circle that I'd diecut out of the red cardstock that came in the kit. I popped that onto the card front using dimensional adhesive. I wanted this to 'slip' off the edge of the card, so I cut the side of it straight, lined up with the edge of the card. Finally I adhered everything down onto some of the lovely navy cardstock that came in the kit and I was done! This card was SO quick and easy to make. I hope I've inspried you to get crafty! The May Card Kit is still available--Go grab one! I love how you used the stencil as an embossing folder, and your sentiment is fabulous, Linda! Beautiful coloring and sparkle...perfect with the pinked-edged circle and striped papers! Great use of the stencil as embossing folder and I love the two toned coloring on Dude too. © LINDA TRACE DESIGNS: Simon Says Stamp May Card Kit-DUDE!